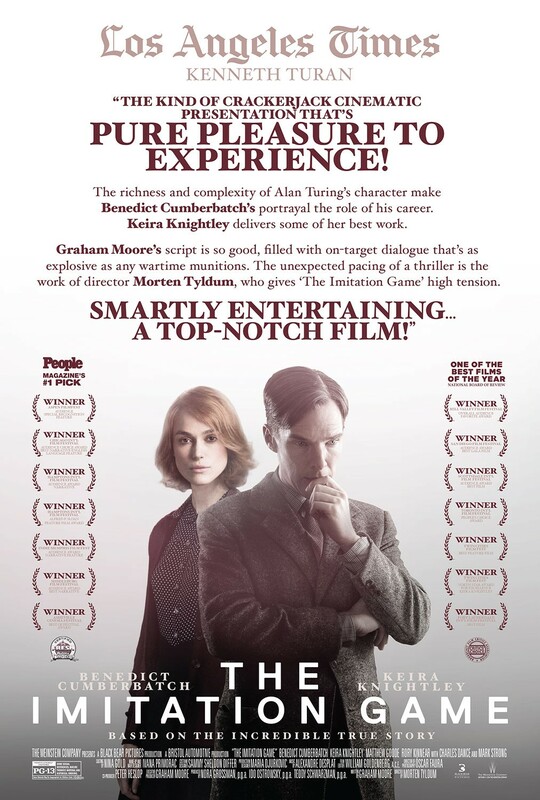 As far as Oscar-baits go, The Imitation Game (TIG) makes for easily watchable, educational historical drama about a previously unsung war-hero, Alan Turing, whose mainstream recognition is far past due; if that doesn’t make your heart swoon just a little bit (particularly given the nature of his prior public shunning), I’m not sure what will. At least it’s nowhere near as contrived as The Theory of Everything (2014)! Benedict Cumberbatch builds his master-machine in hopes of decoding the infamous Nazi enigma encryption. Putting my manspect for Benedict Cumberbatch aside (manspect = respect for manliness/suave/swagger[etc. ]), TIG is a pretty by-the-numbers period drama that follows the work of mathematicians, statisticians, and various other military intelligence nerds working behind the scenes as World War II rages in the foreground. Something that sets TIG somewhat apart from you average boring historical period-piece is its small but tasteful cuts to the actual war battles that the main characters of the film are indirectly affecting. Films like A Beautiful Mind (2001) or Atonement (2007) or similar-minded biopics set against tumultuous world events generally don’t take the brief amount of time to acknowledge the effects of their protagonists on the outside world. TIG’s small but appreciated efforts to visually demonstrate the connection between its cast and the end-all, be-all warfare that’s constantly referenced in dialogue adds considerable weight to their accomplishments. The supporting cast around the Cumberbunster are good and add some adequate room for the latter’s character arc and social growth, as well as offer some likable humor and personalities of their own. Matthew Goode and Keira Knightley are the most memorable of the group besides Cumberbatch, and each sport small arcs of their own. Knightley probably gives her best performance this side of that tiresome Pirates of the Caribbean (2003, 2006, 2007) franchise. Much of what drags down TIG is its numerous pacing issues and unhealthy stretches of filler. What’s sure to irk many historically-minded viewers is that most of that filler is fictitious writing added in as lame attempts to stir up extra drama in the story. Various subplots involving Soviet spies embedded in the British MI6 division and the particular’s of this love triangle or that are unnecessary and don’t add a whole lot to the overarching plot or Alan Turing’s (Cumberbatch’s) character. Cumberbatch (bottom center), Keira Knightley (right), Matthew Goode (top center) show those Nazis who’s boss. SUMMARY & RECOMMENDATION: Cumberbatch delivers as one of the most entertaining and talented up-and-coming actors working today. His portrayal of the previously unappreciated Alan Turing is sympathetic, likable, and suitably tragic. In his own way, he does the quiet war hero justice. The way director Morten Tyldum incorporates elements of the outside world and the greater conflict at large adds depth to this otherwise quiet adventure. — However… nothing much exciting or dramatic happens during the whole movie, and things aren’t helped by numerous side-plots that don’t go anywhere and altogether uninteresting romantic teases. It always amazed me out of the three Bend It Like Beckham stars, Knightley, Parminder Nagra and Archie Panjabi, Knightley was the one who became the big movie star! And it seems unimaginable that a man who did so much for the war effort only received a ‘posthumous pardon’ (which I believe is not the same as having his conviction quashed) sixty years after his death.